Stunning countryside, mountains and rivers to ride out in. 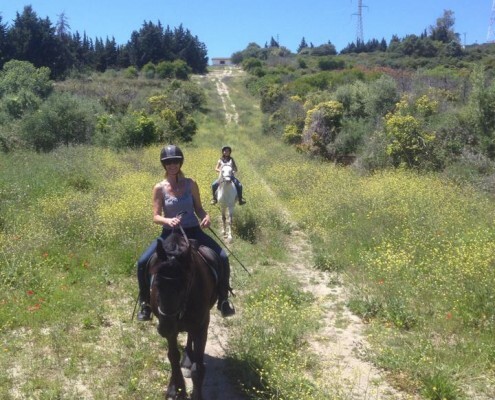 Come on a hack – beginners & experienced riders welcome. Looking to start or improve your riding? 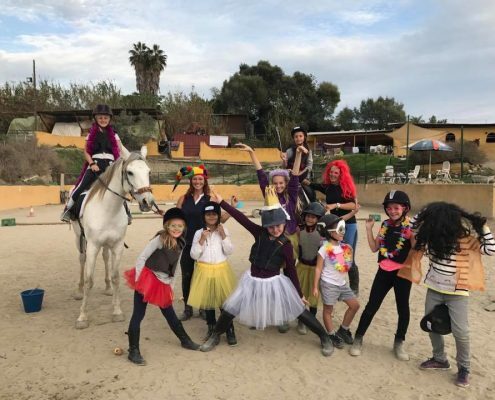 Enjoy dressage and jumping lessons with our friendly, experienced instructors. 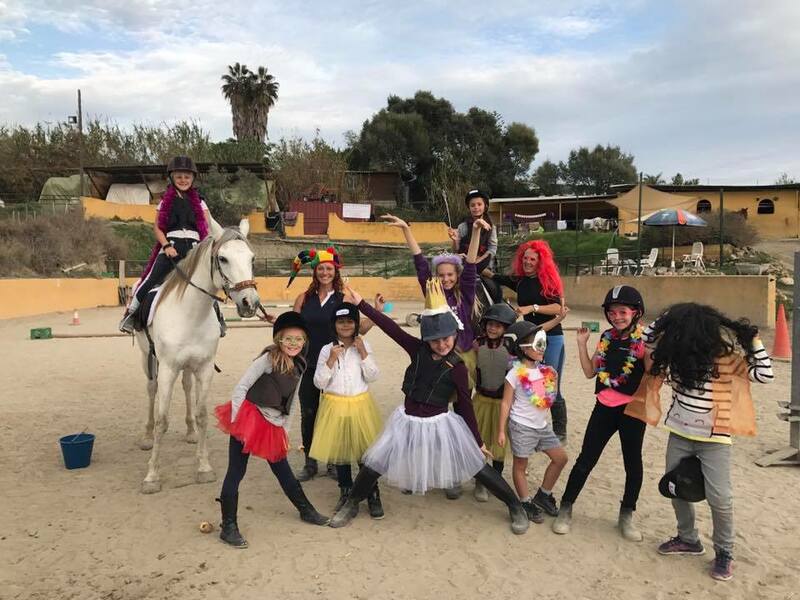 Riding is for everyone – from ages 8 – 80! Join our growing number of liveries and enjoy great facilities with the support of our friendly team. 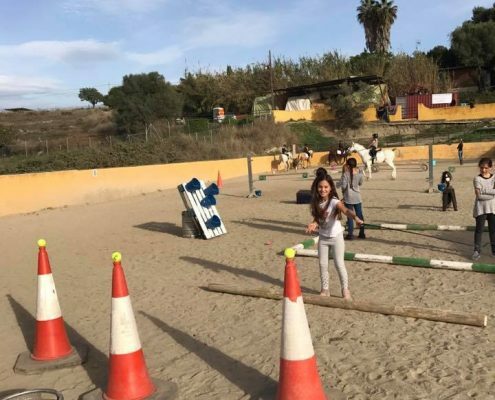 Stabling, paddocks, pista, horse walker, lunging ring & fabulous riding countryside. 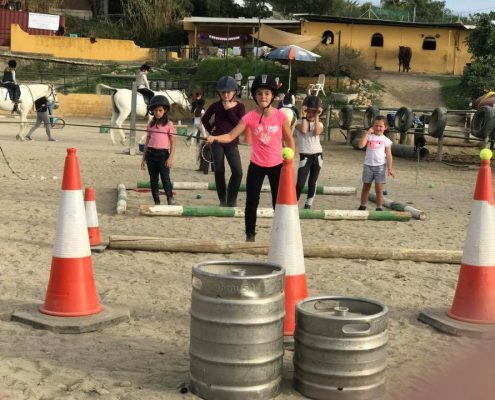 A safe & fun environment for learning, lessons, competitions, hacking out and all things “horsey”. 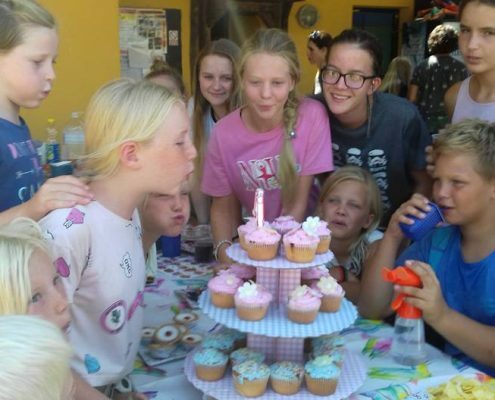 Sessions every week for children ages 8-16. 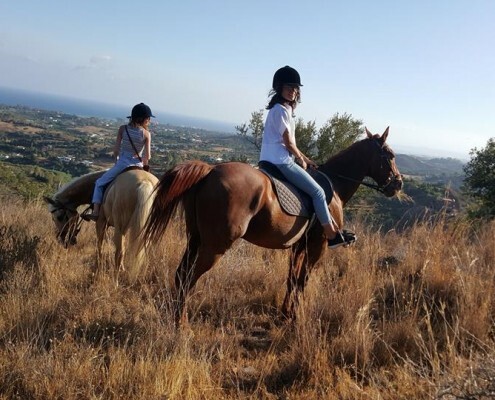 Starting autumn/winter 2016 – enjoy 4 – 8 days riding holiday on our wonderful horses. 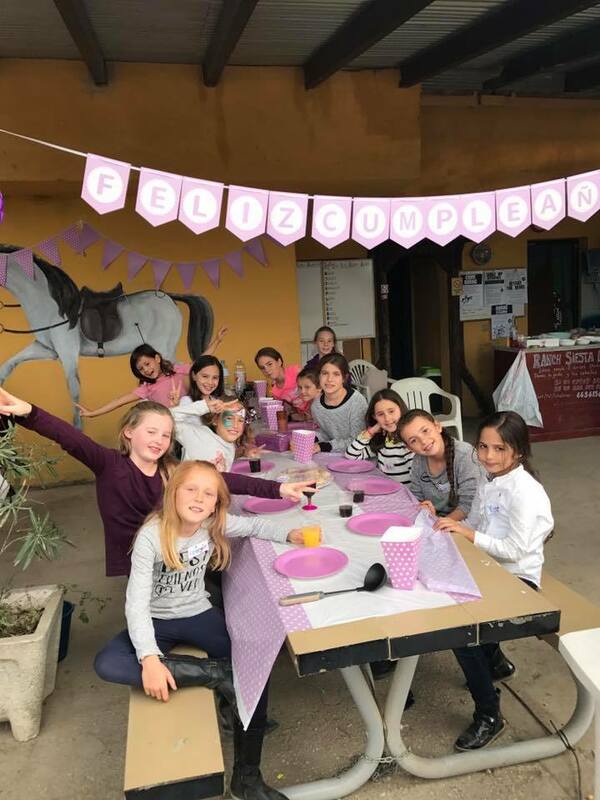 Our holidays including lessons, hacking out and social time! 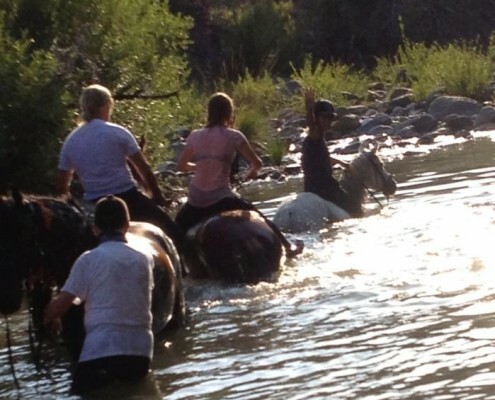 Enjoy this incredible sport with our experienced RAID endurance team. Arabs in training, livery and competition. Have fun & get fit! 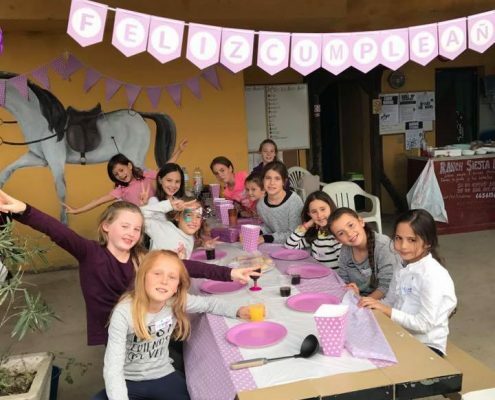 Horse riding Estepona – a friendly riding stables with horse riding lessons, hacks, kids events, livery & more. 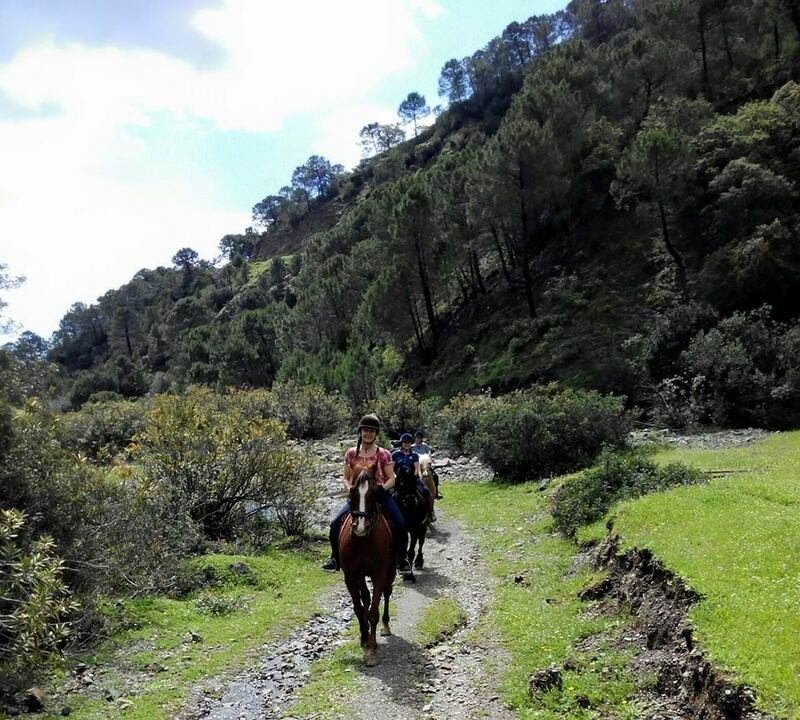 Perfectly located between Marbella and Estepona, we have the beautiful Sierra Bermeja National Park to ride out into. 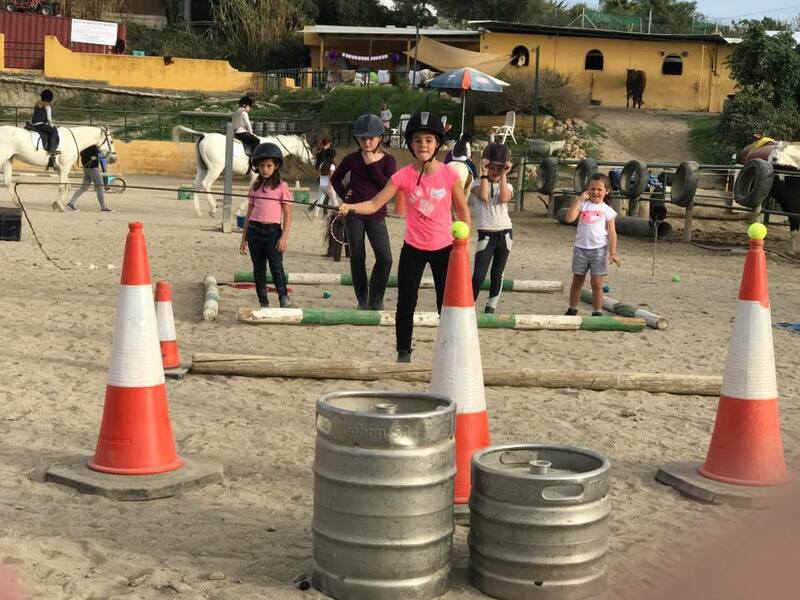 Whether you are an absolute beginner wanting an introduction to horse riding or an experienced rider, we have something for everyone. 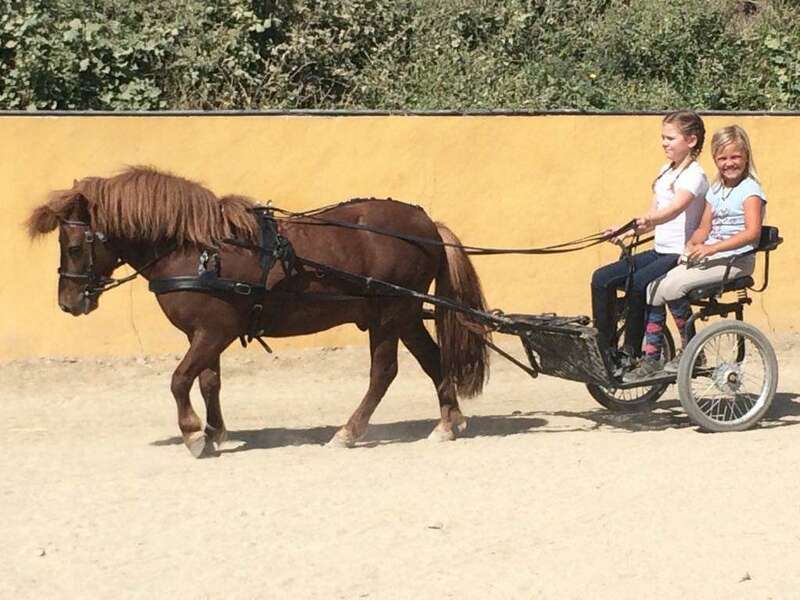 With a new lunging ring, horse walker, large pista (school), great instructors, friendly people and over 20 horses here including liveries, come and join us. We ride until around 7 pm in autumn. Lessons Tues, Weds, Fri morning, Saturday and Sunday. 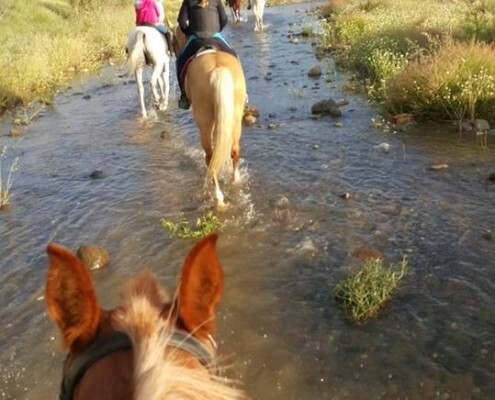 Enjoy time riding your own horse! Without the cost of purchase & care. Plus all lessons half price. 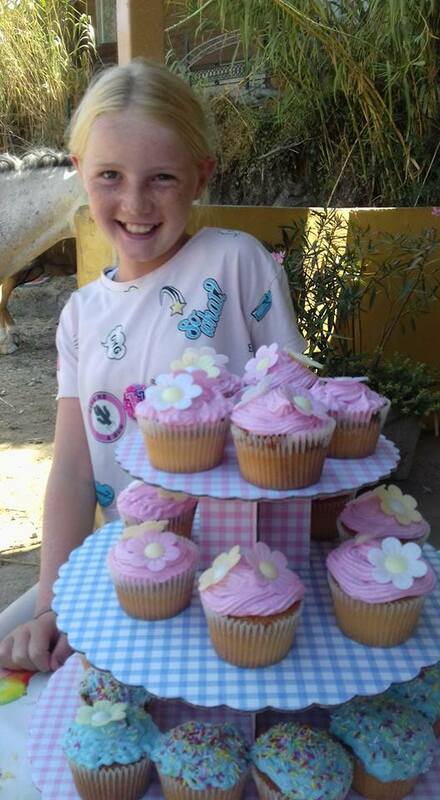 Book our gorgeous, super friendly little Appaloosa Shetlands – Pin & Pon – for pony rides at your birthday party or event. There’s nothing more magical than these two for your little ones. 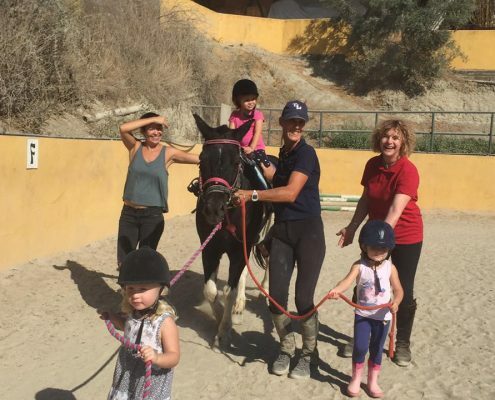 Horse riding Estepona – join us! 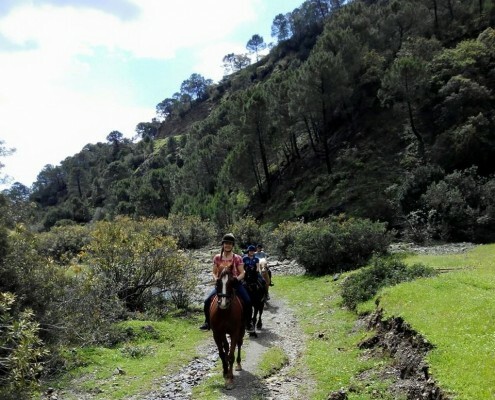 3 hour cantering hacks into the SIERRA BERMEJA natural park with goats, birds of prey & stunning views for experienced riders. Or a slightly slower ride takes 4 hours. 2 hour VIEWPOINT hack is amazing, for those that can walk and trot. We also do 1 hour TASTER hacks for total beginners. 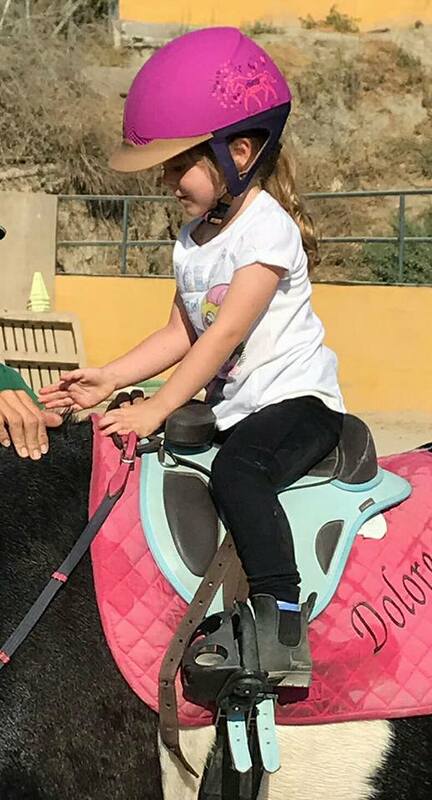 OUR BESTSELLER : 2 hour SADDLE UP EXPERIENCE (minimum age 7 years). 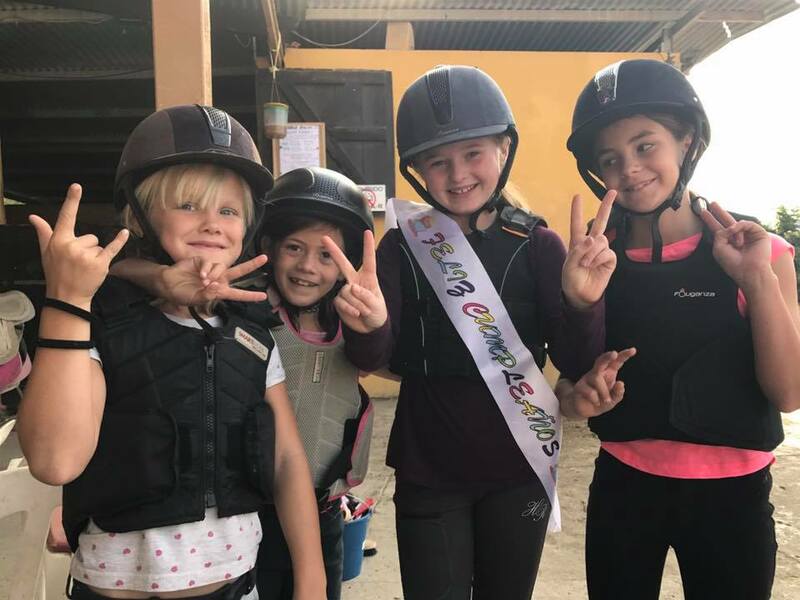 Meet, groom, tack up, have a “get confident” lesson in the school and then all go for a wonderful ride out in the countryside. Friendly and beautiful horses. Myself and my partner went for a hack today, beautiful countryside, really lovely, bulletproof horses. Thank you! We had a lovely experience. 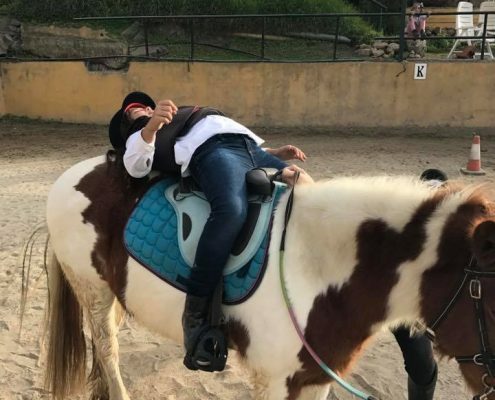 It was me my 10-year old daughter and my cousin, all with riding experience. We rode out in a fantastic environment with sheeps, hawks and great views. Can absolutely recommend this place to everyone! 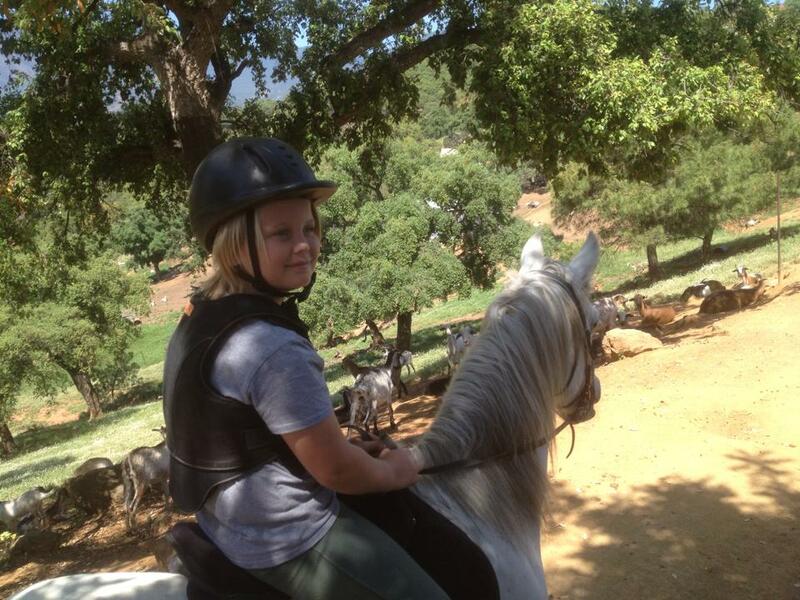 Fabulous day with Caroline riding in the hills on our vacation. The horses here are well looked after, forward going and very responsive. 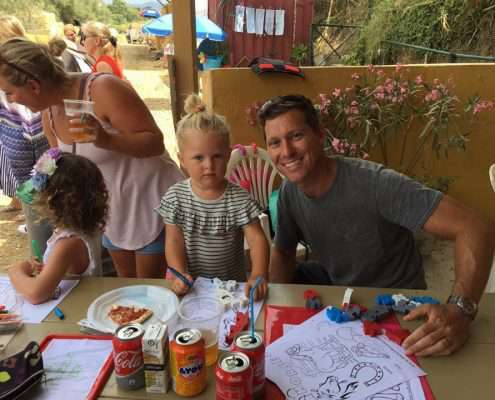 Everyone was really friendly, helpful and we loved our time here – we will be back in a few days for another ride. 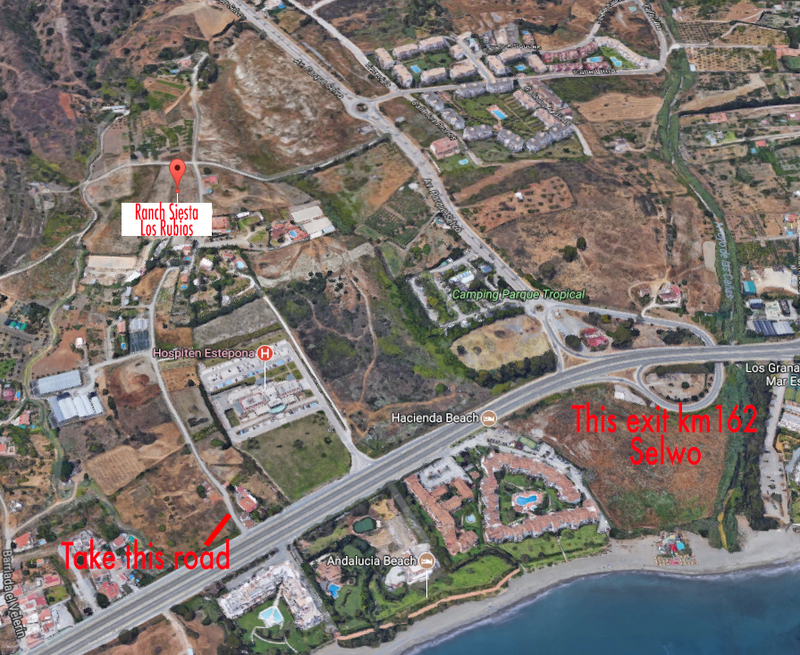 The yard was clean and tidy and the location is spectacular – straight into the hills with very little traffic and then beautiful views of Estepona and the mountains – my favourite hacking experience to date. 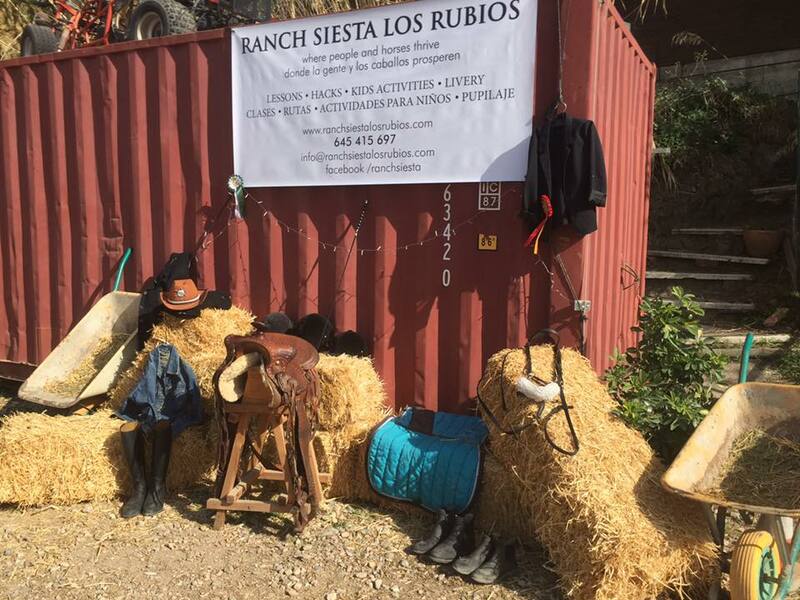 I spent the day riding at Ranch Siesta Los Rubios on Tuesday and I loved every minute of it. 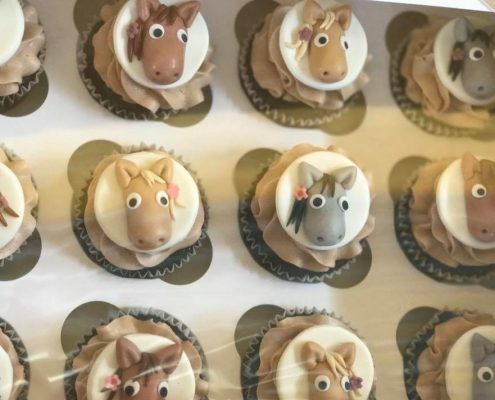 ..The horses all looked really happy. The access to trails is awesome and you will never tire of the options of places to explore. I had expected to be led but was given a lovely horse to ride solo with some basic but essential tips and we all hacked out as a group. 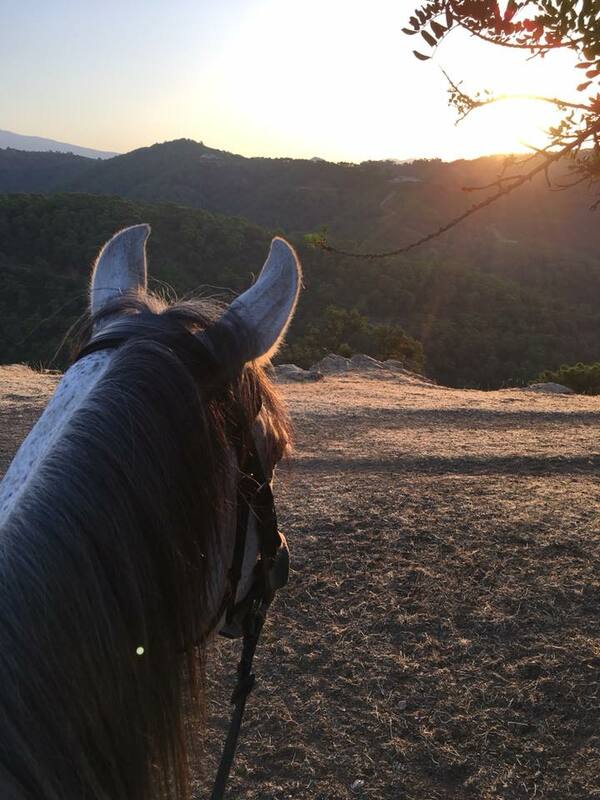 This horse was wonderfully behaved and the views on the ride were stunning. Caroline put me at ease all the way and maybe this has sparked something as I’d definitely ride again. All the horses were beautiful and well kept. 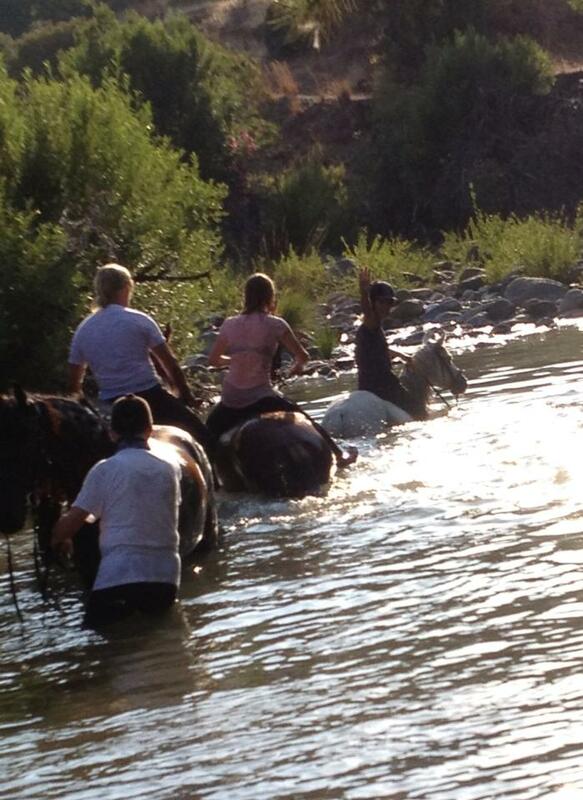 I went to go riding and I had so much more fun then what I expected! 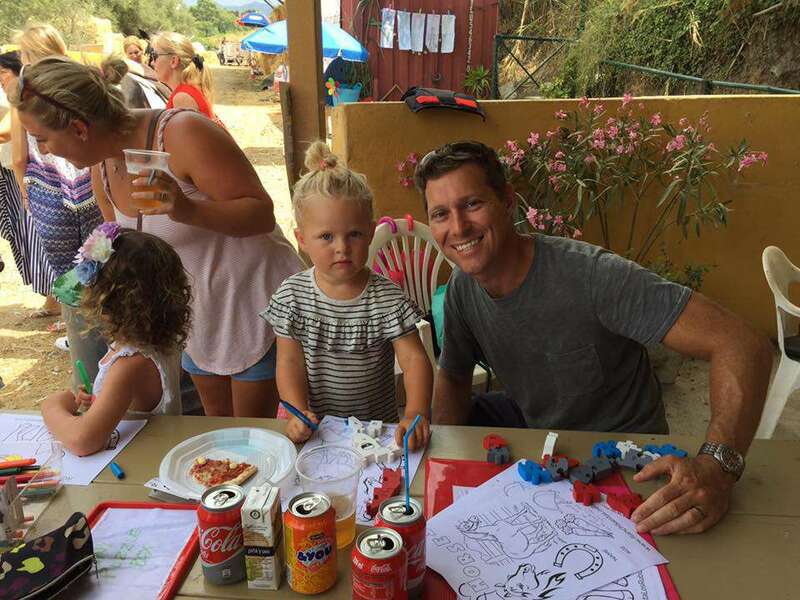 Its fun for all the family! 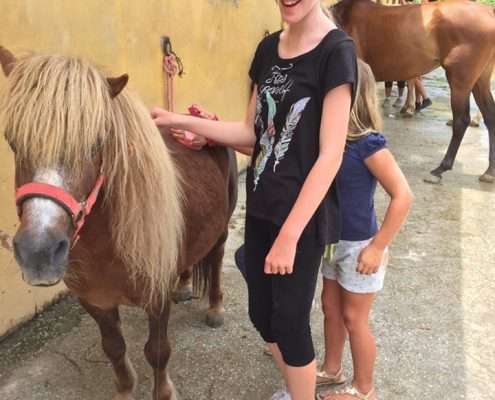 You will have great experience with the horses. Its a great way to spend your time. Its perfect for all nature lovers! 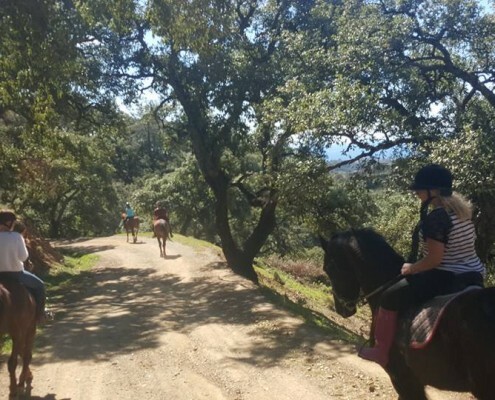 I had a truly amazing time hacking out in the beautiful countryside of Spain for pleasure and training my horse, who is honoured to live there in trusting hands. 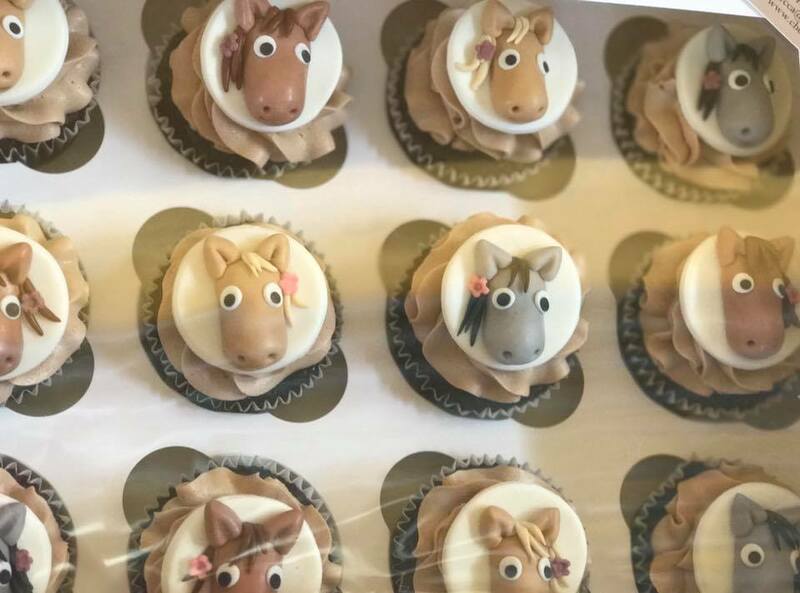 I’m very lucky to have found Caroline ….A true taste of horse heaven which I’m lucky to have found.I recommend this fantastic place to all!!! 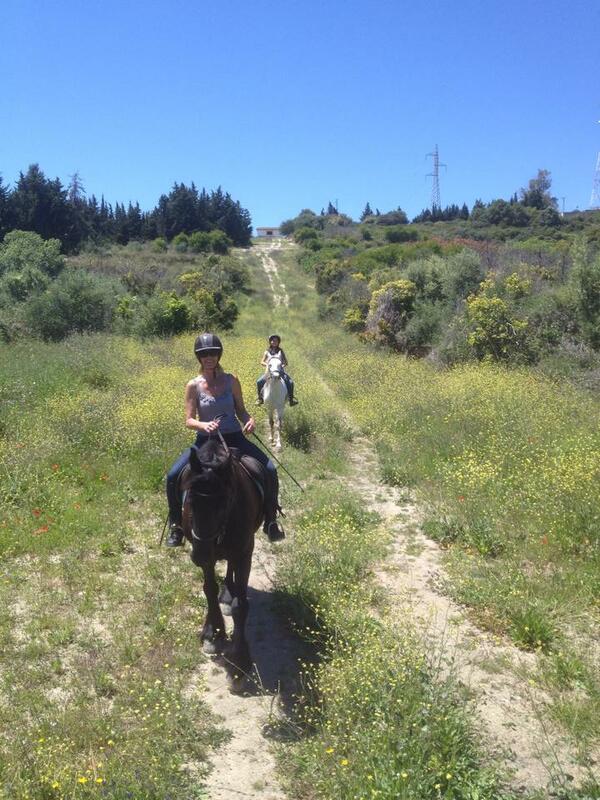 Great hack today with great horses. The people here, Caroline and her team (inc family) were fantastic ! Went out in to the hills with some amazing views. 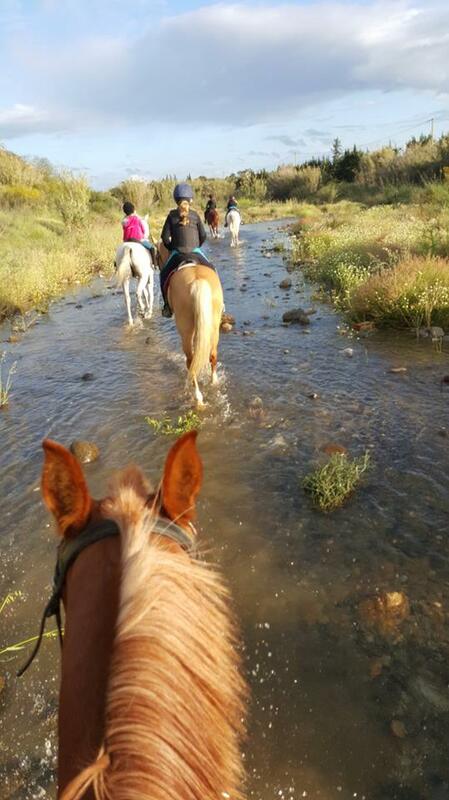 The horses were responsive, yet well controlled and worked well. Going back again before the end our holiday. 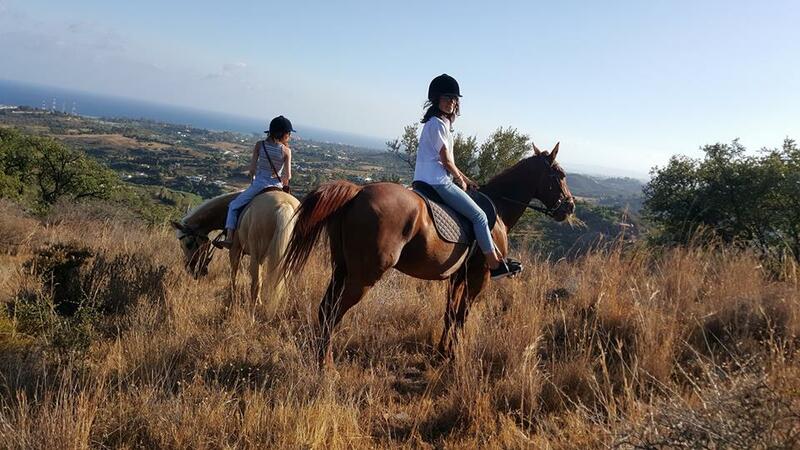 Fantastic riding with Caroline! 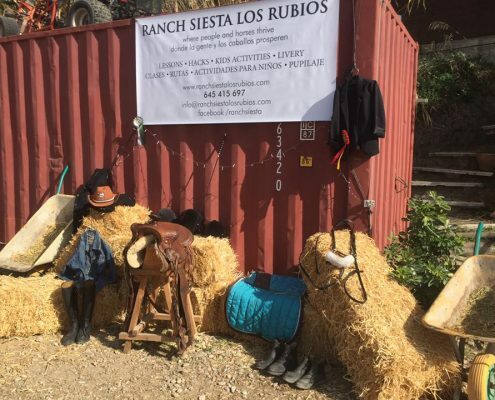 She really takes care of her horses and ensures all riders are given the best horse for them to enjoy a great ride and hack out safely.The hacks are fun and fantastic tracks. 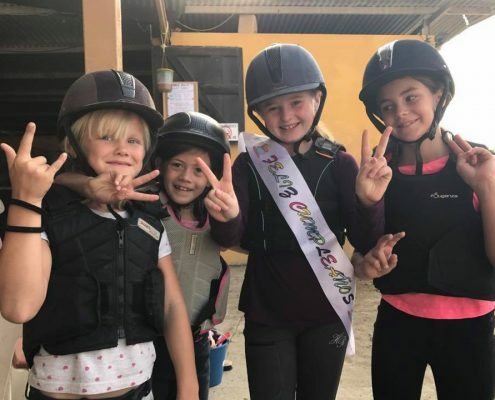 Want to improve your riding for fun or for competition? Or maybe just make your first steps into this wonderful activity? 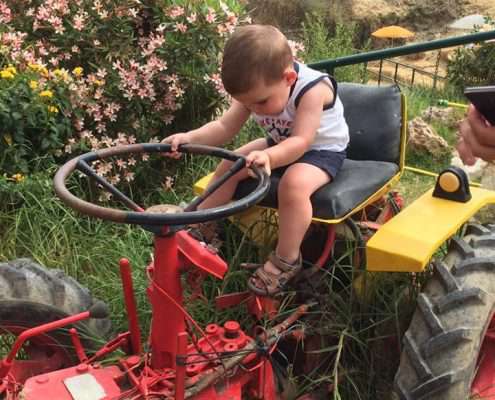 Don’t worry, our experienced instructors will look after you from day 1. 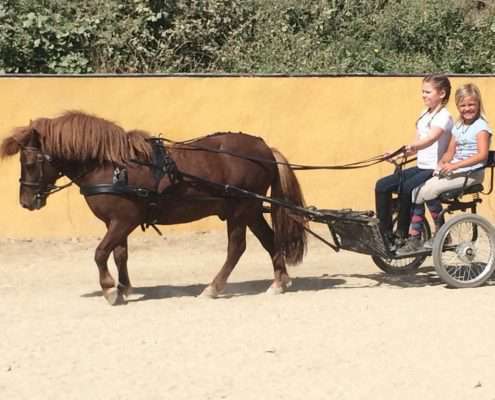 Group and individual lessons, all ages, available from 20 euros/hour. I went from totally scared to loving riding in 2 hours !! I can recommend this place to everyone. 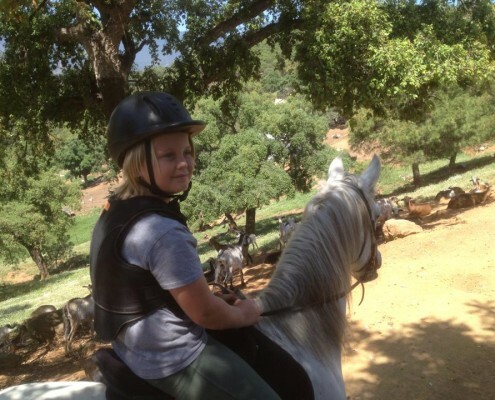 My son loves having his horse back riding lessons with Caroline. She is amazing with children. 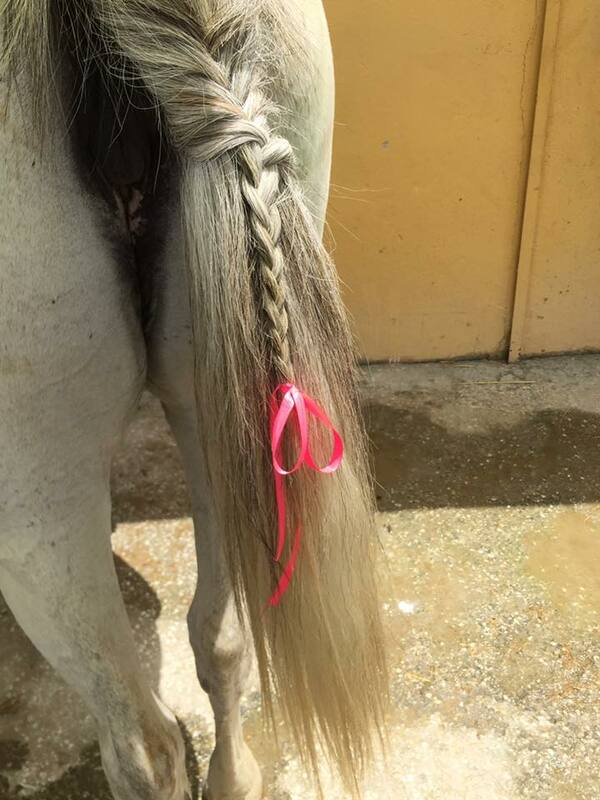 She is fun and very patient. 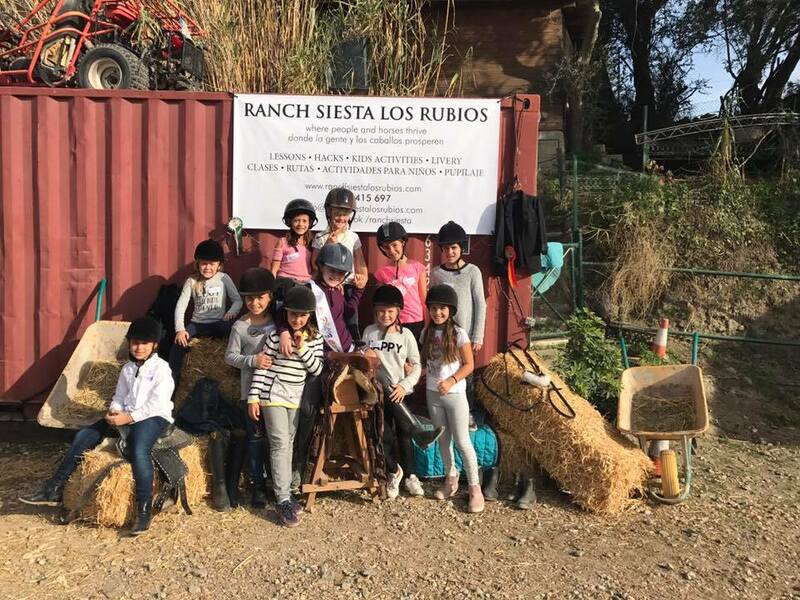 They learn to also take care of the horses and not just ride them which I think is very important. The horses are well taken care of. 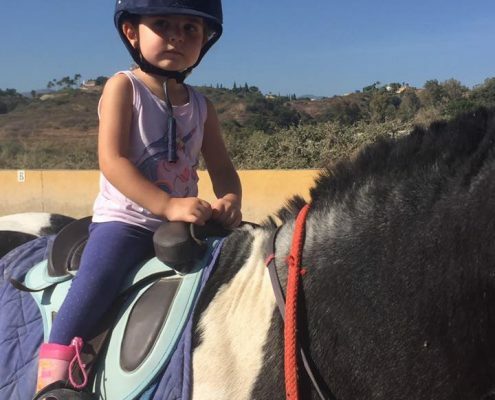 We took our toddler along to the Mums & Tots (Pony Hour) session on Fridays. 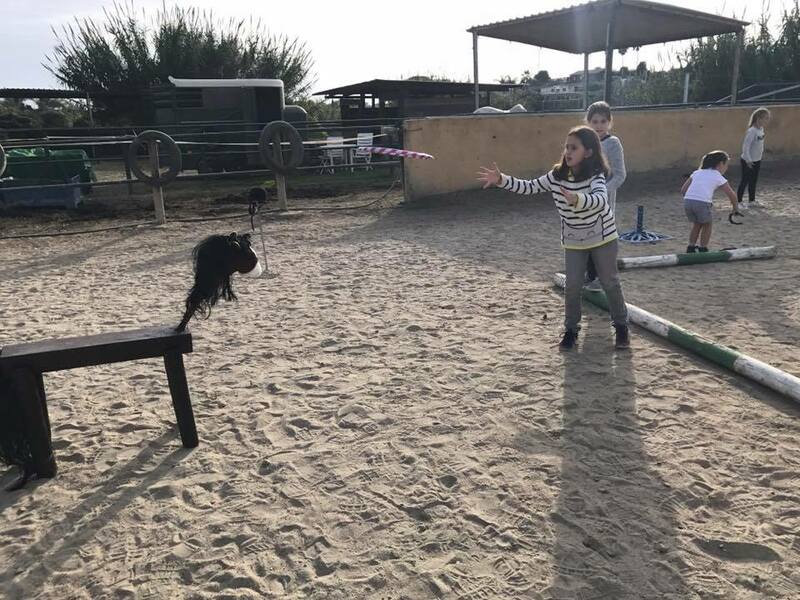 She absolutely loved it! 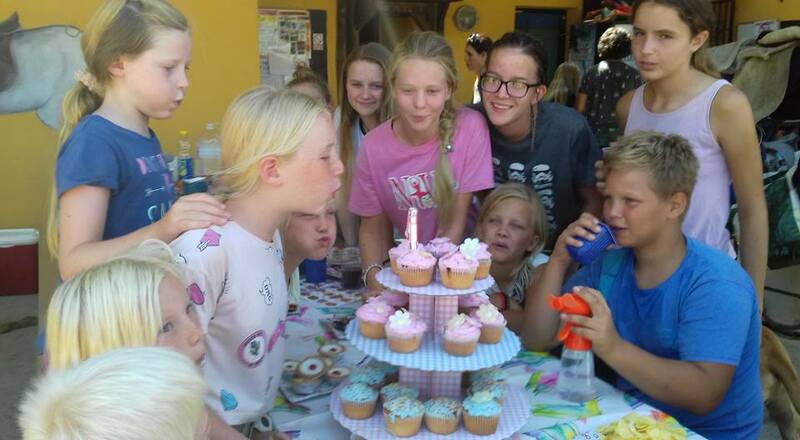 Caroline was great with all the kids and they had a great time. 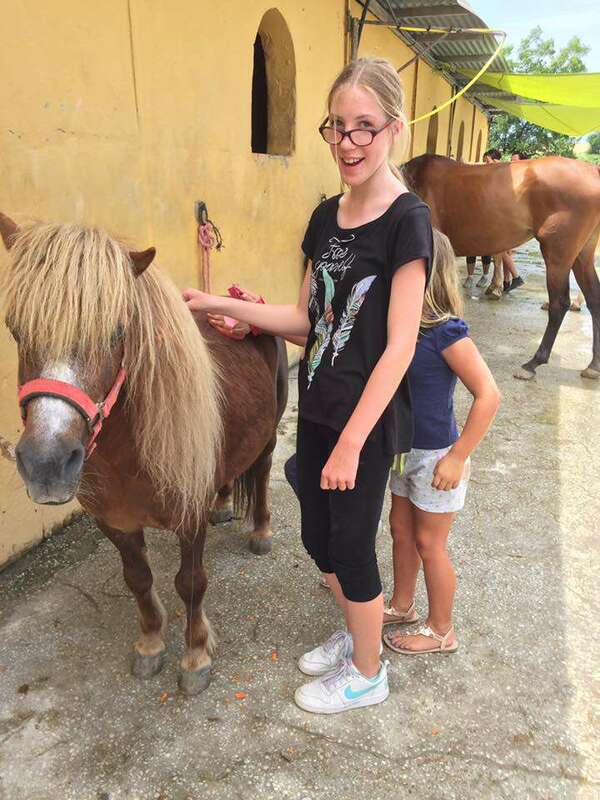 We liked it so much that I went along to the Adult Pony Club. 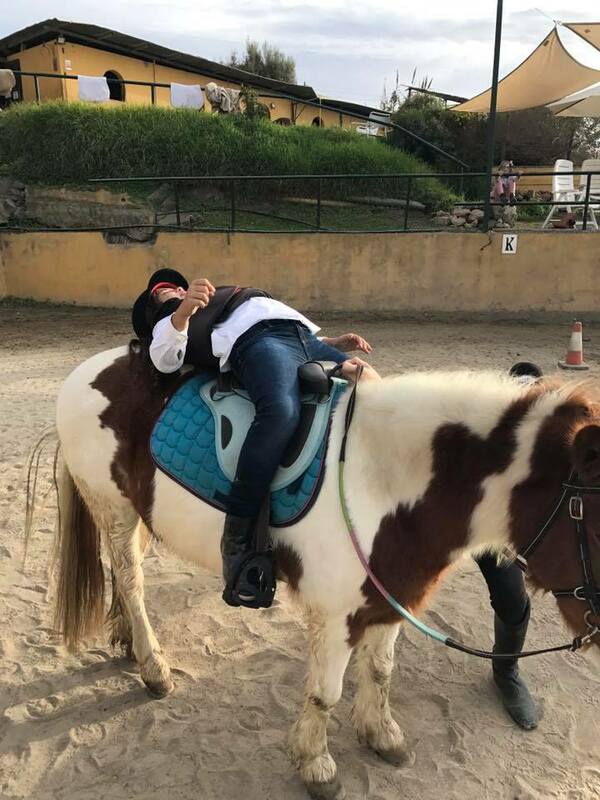 I haven’t ridden for nearly 3 years but I got a great horse and had a fantastic time. Highly recommend. Can’t wait to go again when we next visit. 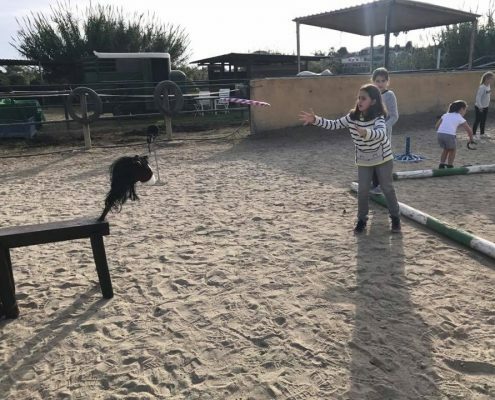 Following my first lesson with Paulina my confidence soared…I had had previous lessons at an alternative stable however my progress was zero which frustrated me. Caroline & Pauline have this great ability to encourage one & be hungry to learn more. I return to Spain next month & will be booking a period of intensive lessons. 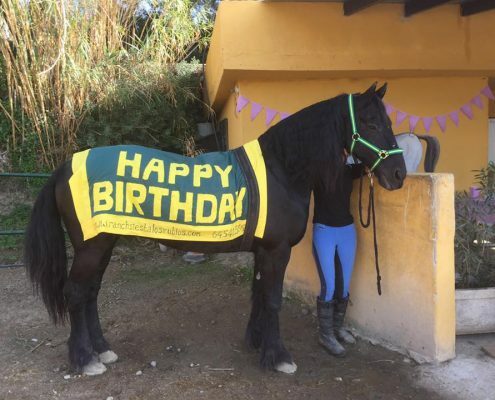 I have been going to this stable for around 4 years now.In this amazing stable I gained a lot of independence and learnt lots of new things over the years. 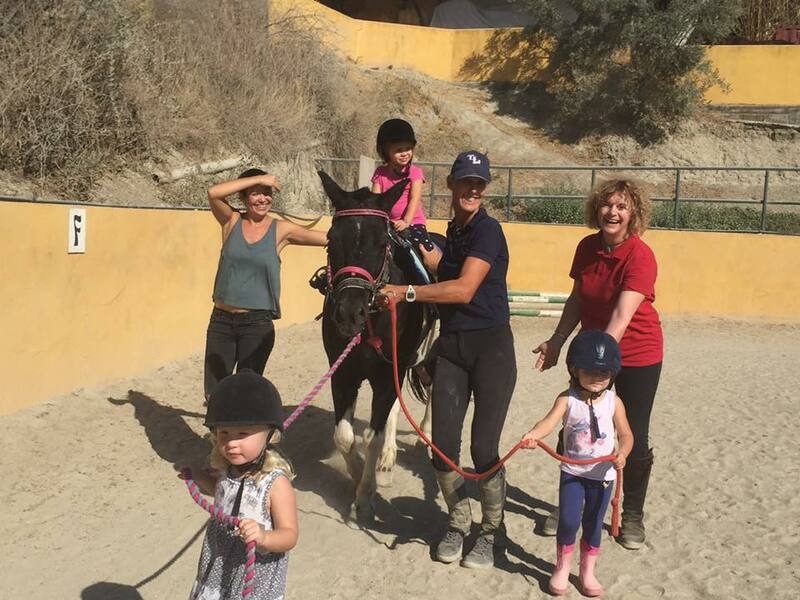 The owner of the stable Caroline will help you gain lots of confidence in your riding.The horses are very friendly and trust worthy. 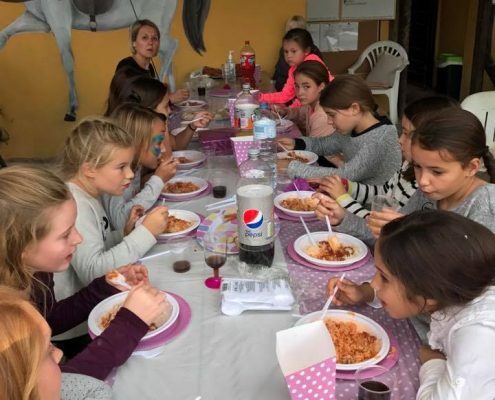 What a beautiful time for the little ones!!!! 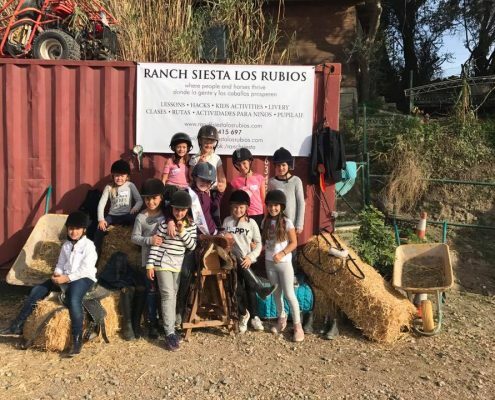 Thanks to amazing staff my 8 years old overcame his fear and even wanted to repeat the ride and both have learned in an hour with ponies, how to take care of them. Loved it! 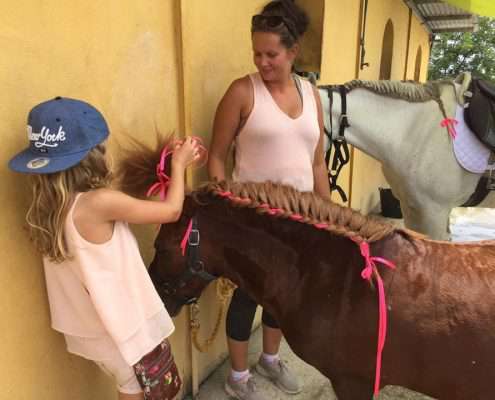 Do you want to introduce your little ones to horses? 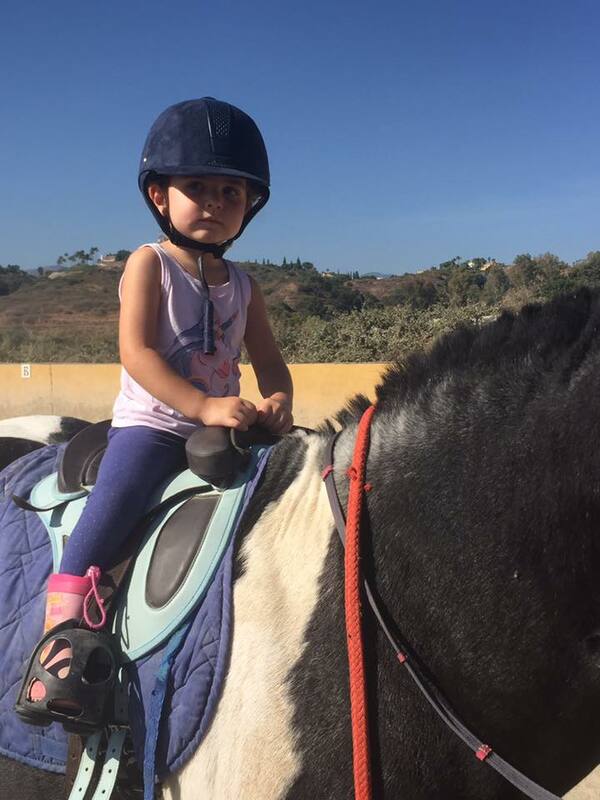 Have you a few pony mad toddlers and friends? 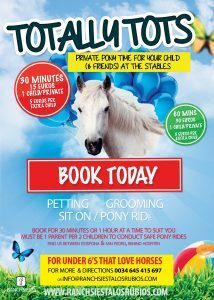 Book a private TOTALLY TOTS sesssion with our ponies. Book 30 or 60 minute session. Perfect for 6 & unders. 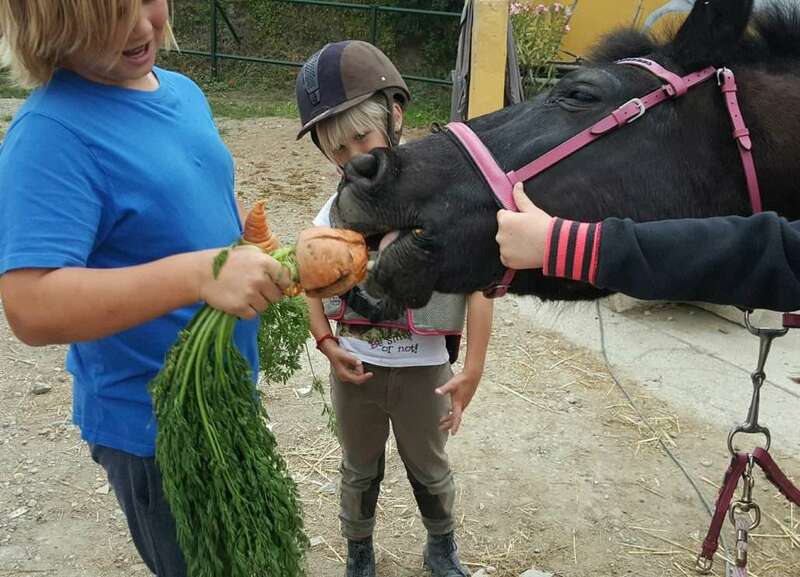 Meet, groom, pony rides, carrots for ponies, juice for kids. 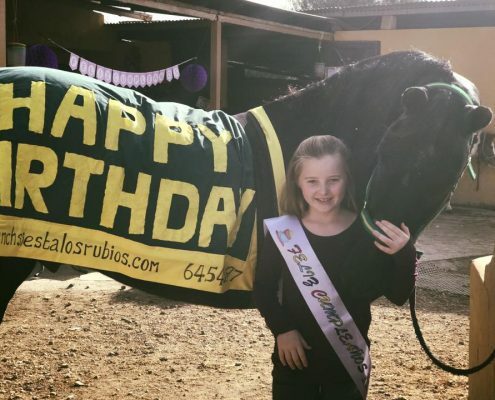 We host great pony birthday parties for under 11s. Riders and non riders welcome. 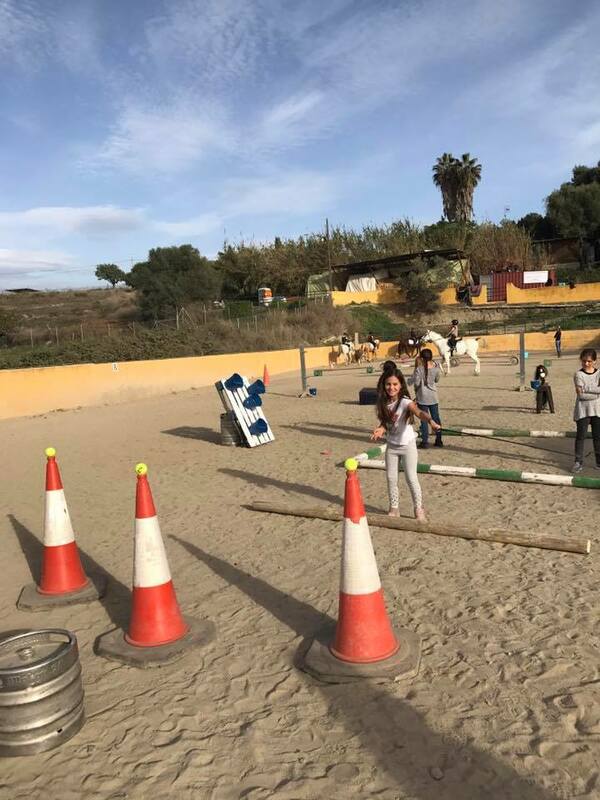 prizes, obstacle course….and lots of fun. 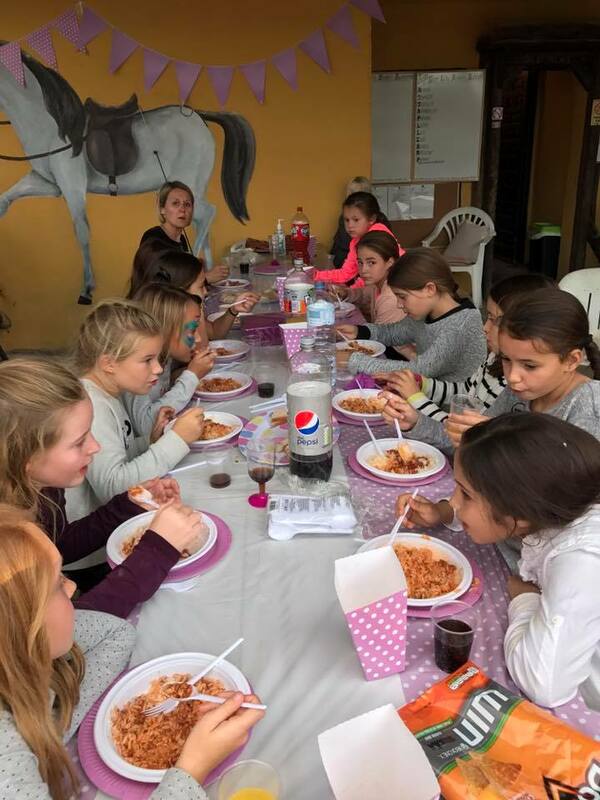 A number of parents must stay for each party depending on number of children..
Our experienced team will help make horse ownership easier. pista (school), lunging ring, turn out paddock. 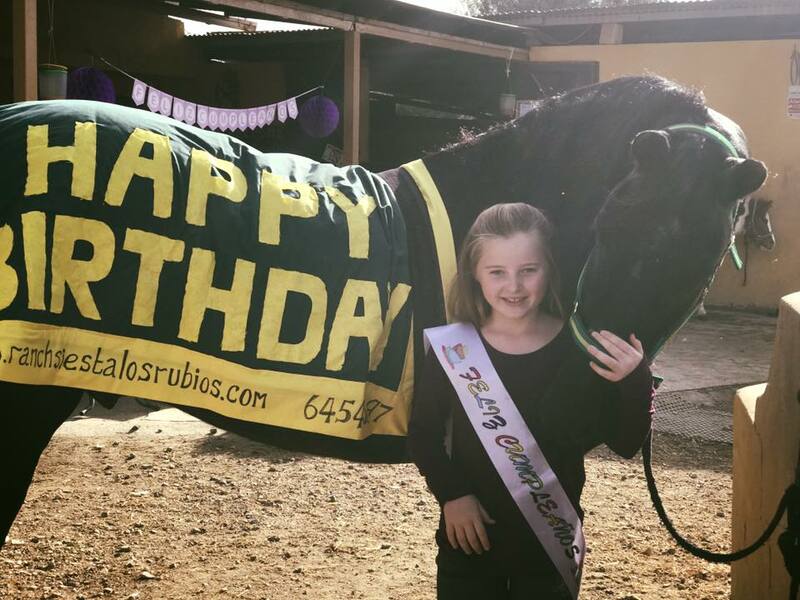 Plus you can join our other liveries & team on hacks out (or Pony Club sessions for younger owners). 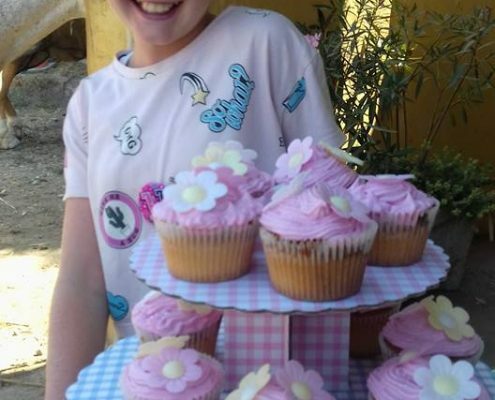 ALL LESSONS, EVENTS AND CLUB SESSIONS ARE HALF PRICE FOR LIVERIES. 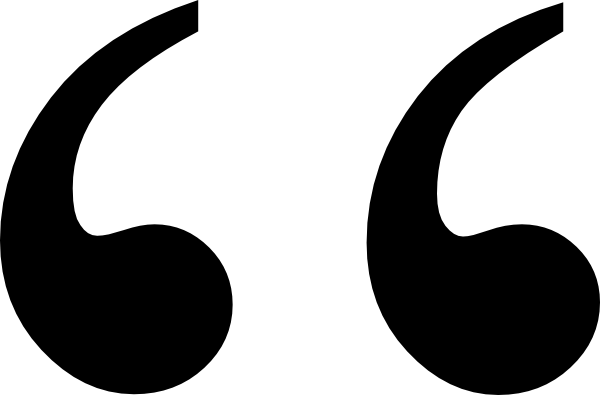 I have my horse in the stables…and know I have done best for him and for myself. Well kept stables by Caroline who is the best person I could leave my horse with. 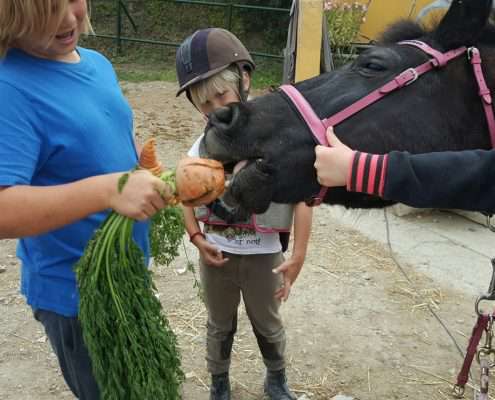 I already learn more about horses and as they run group classes I will learn even more :). 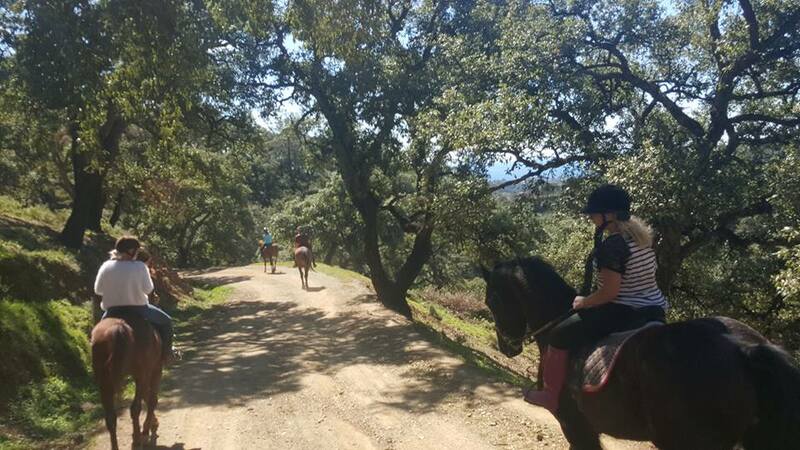 At the stables you can feel family harmony and everyone is welcome to relaxed place surrounded by beautiful Spanish nature. 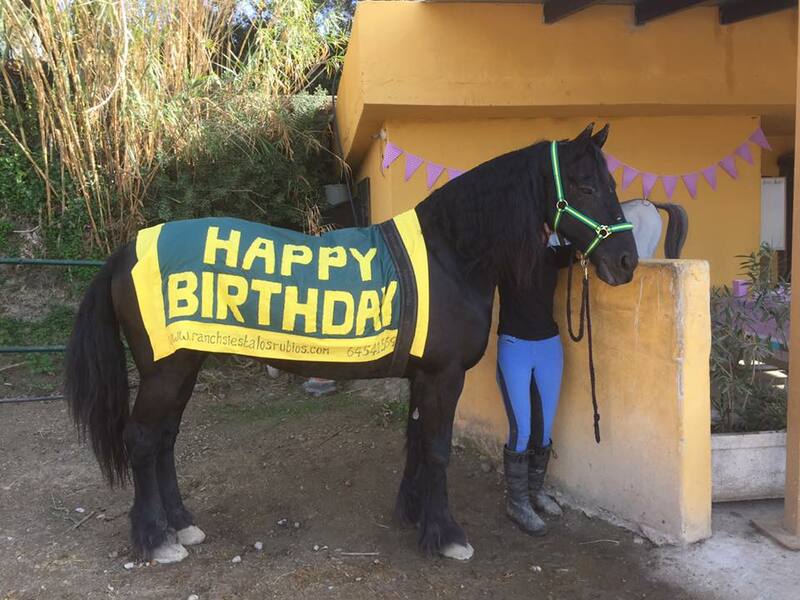 At the grand of age of 45 it was time for my first horse. 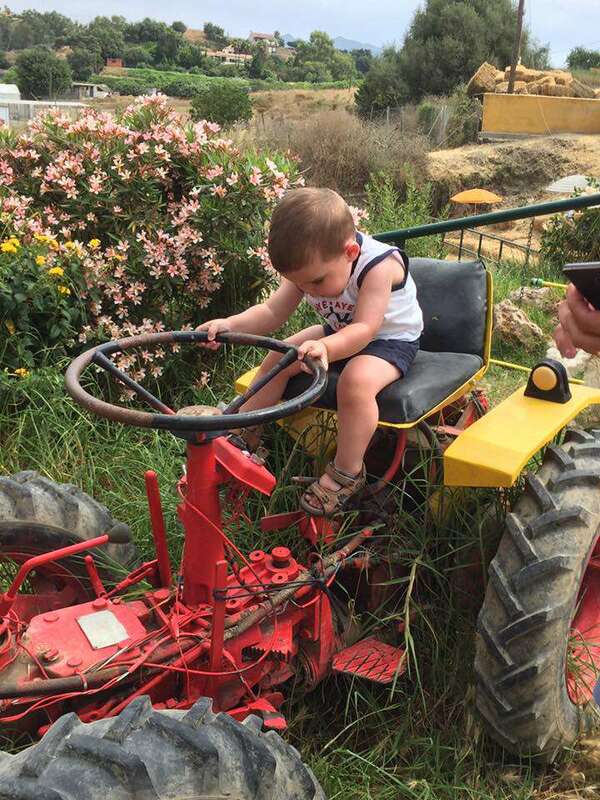 Caroline found the perfect boy for me – Ahitan. When I am away everyone here looks after him so well. We are both very happy, learning, laughing and enjoying this very special place. This place is great. 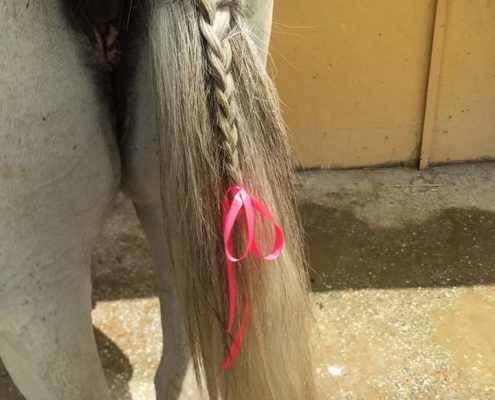 My horse has a fantastic life here. 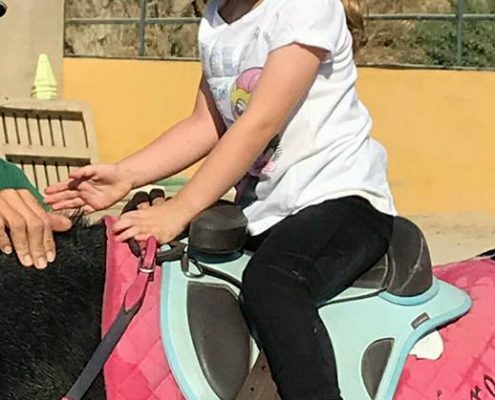 I have to work and cannot spend the time I would like with her but thanks to Caroline I know she gets love and attention even when I’m not there. This place is basically my life I can’t even imagine what I would do without it! Right now I am part loaning and so is few other girls! I just think it is amazing. Photos of a few of our liveries. If you don’t have your own horse but would like to experience ownership, why not PART LOAN one of our horses? 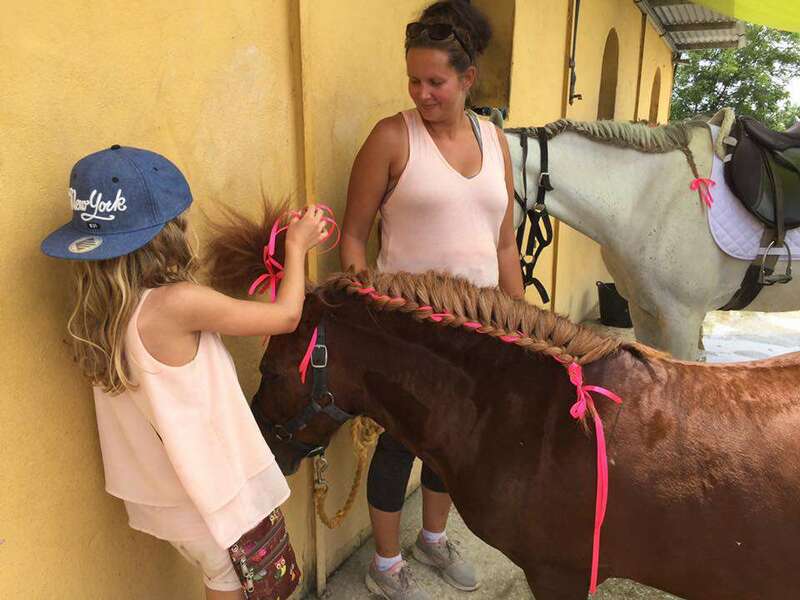 65 euros/week for up to 10 hours riding. 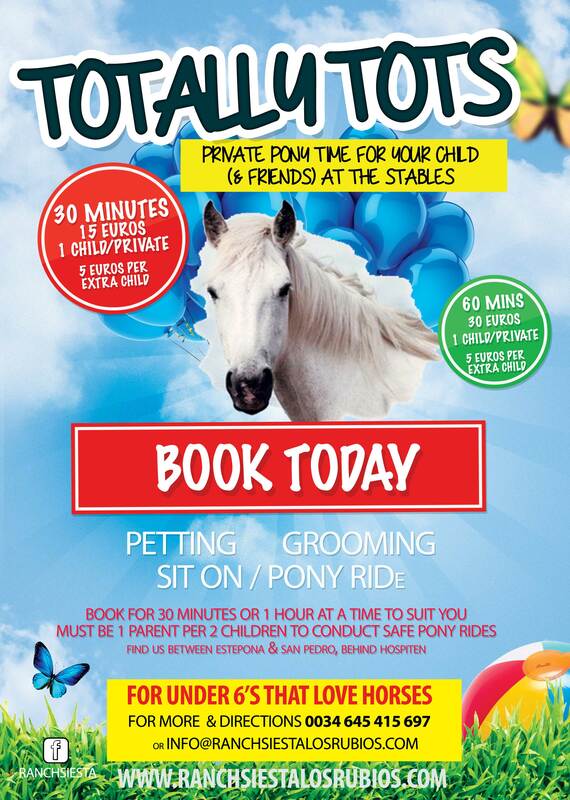 ADULT RIDERS only (Mon – Fri during school hours 9-4 pm approx). We look after them, you enjoy a special relationship & riding with one horse. Please ask.